Forever Unbridled won the $2 million Breeders' Cup Distaff on Friday to cap the opening day of action in the $28 million Breeders' Cup at Del Mar Racetrack. The day's four races offered a tantalizing warm-up to Saturday's nine-race slate, which will feature Arrogate going for a repeat in the $6 million Classic, and Highland Reel aiming for a repeat victory in the $4 million Turf. Highland Reel trainer Aidan O'Brien opened his account with a victory in the one mile, $1 million Juvenile Turf, where Mendelssohn gave the Irish trainer a 27th Grade/Group One victory of the year. O'Brien, who had broken the late Bobby Frankel's world record with his 26th Group One win last weekend, was disappointed in his first opportunity to extend the record on Friday in the Juvenile Fillies Turf won by Rushing Fall. Trainer Chad Brown notched his second straight win, and fourth overall in the race over one mile on Del Mar's tight turf track. O'Brien's September finished third with a strong late run after an awkward start. But stablemate Happily, a two-time Group One winner in Europe sent off as the 2-1 favorite, finished last in the field of 14. "She took too long to find a gear and by then it was too late and there was some horses in front of her," jockey Ryan Moore said. Moore made sure it didn't happen again in the Juvenile Turf. Mendelssohn broke sharply from the first stall, settled in behind the leaders and powered around the Richard Fahey-trained Sands of Mali as they turned for home. Down the stretch he pulled away to beat Untamed Domain by a length, with Voting Control third, a further half-length back. "It went very smooth," Moore said. "When he hit the front, he wasn't quite sure how to get down and gallop yet. So I think there's more to come from him." The $1 million Dirt Mile produced plenty of drama as Battle of Midway out-dueled Sharp Azteca in the stretch. The 18-1 shot trained by Jerry Hollendorfer and ridden by US-based French jockey Flavien Prat got the victory by half a length with Awesome Slew a distant third and 2-1 favorite Mor Spirit was eighth. The spotlight, however was on the Distaff, where Forever Unbridled seized the win a year after finishing third in the same race at Santa Anita. The 5-year-old mare trained by Dallas Stewart and ridden by John Velazquez, was racing for just the third time this year in the 1 1/8 mile race. Sent off at odds of 7-2, she was sixth in the early going, running smoothly on the outside. Velazquez, picked for the ride over Joel Rosario who had piloted Forever Unbridled to victory in the Fleur De Lis and Personal Ensign Stakes this year, took her to the front around the turn and powered home. "I know it's a short stretch, so I wanted to make sure I wasn't too far back," Velazquez said. "Once I got her running -- I got to the lead a little bit too soon -- but she got it done anyway." Trainer Bob Baffert said he couldn't fault Abel Tasman's run, even though it left his Kentucky Oaks winner in second by half a length. Paradise Woods was third, three lengths back, and Elate, sent off as the 2-1 favorite, finished fourth. "She just got beat by a really good horse," Baffert said. "That was a tough race." 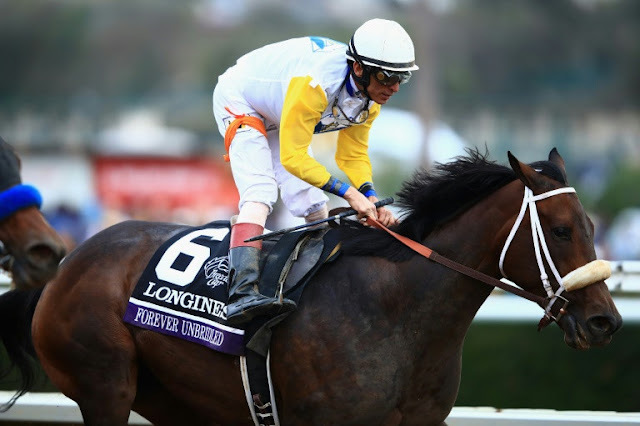 0 Response to "Forever Unbridled springs Breeders' Cup Distaff surprise"